Every week I try to post one free action, one set of digital papers or other design freebie, and one set of photographer storyboards. Today it is a rainy, cool day and I was inspired to design some storyboards that would be perfect for your fall/Halloween images. This storyboard set has special clipping masks with optional drop-shadow and a customizable background. These storyboards would look great on your website/blog/Facebook page or printed for your clients. 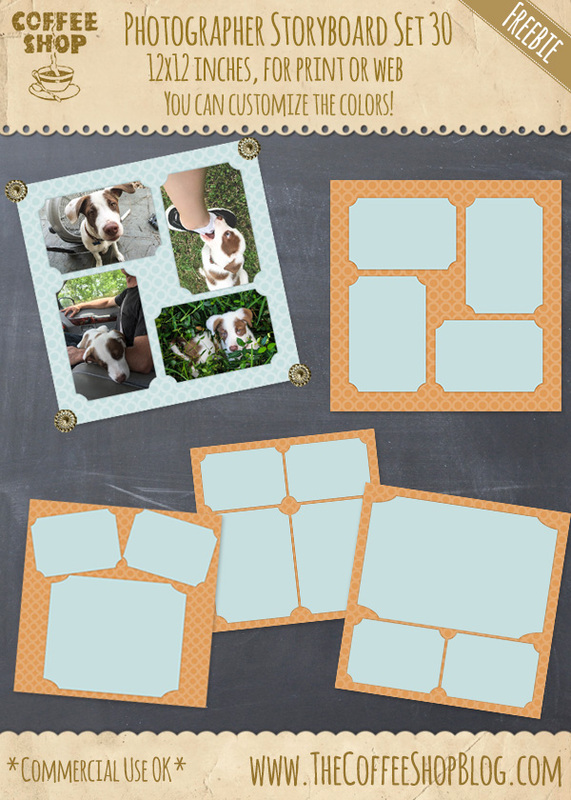 You can move or resize the cutouts to taste (before adding any images) and change the fall-themed background paper color to any color you want or even add a digital paper of your choice. You can also flip these vertically before adding images which gives you eight storyboards (well, actually 7 in this case as the first one is the exact same flipped) in one download! I have a huge selection of free storyboards posted on my blog, you can find them all here. Download the CoffeeShop Storyboard 30 Set. You can also download it here.